A new analysis from Bloomberg New Energy Finance predicts a global electricity supply mostly fueled by carbon-free sources by 2050, with a “chilling” outlook for fossil fuel generators and little hope for a nuclear resurgence with today’s technology. The New Energy Outlook report concludes a “dramatic shift” to “50 by 50” is being driven by cheap renewables generation and falling battery costs. Solar and wind costs are expected to drop 71% and 58%, respectively, by 2050. Worldwide, the report predicts $548 billion will be invested in battery capacity by 2050, with two-thirds of that at the grid level and the remaining third installed behind-the-meter. In total, Bloomberg’s new analysis sees $11.5 trillion being invested globally in new power generation capacity from 2018 to 2050, with the majority going towards renewables. About $8.4 trillion will be spent on wind and solar, and another $1.5 trillion on other zero-carbon technologies such as hydro and nuclear. According to the report, since 2010, the price of lithium-ion batteries has declined 79%. Now, stand-alone batteries are increasingly cost-competitive with open-cycle gas plants and other options such as pumped hydro. “The conclusions are chilling for the fossil fuel sector,” Elena Giannakopoulou, head of energy economics at BNEF, said in the report. In the United States, Bloomberg expects batteries to grow in significance from around 2030, to support renewables penetration. 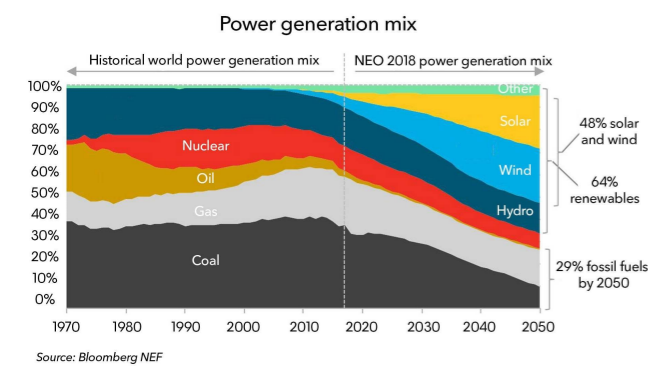 Utilities will continue to replace older coal and nuclear with cheaper gas and renewables, though Bloomberg adds the qualifier, “assuming there is no lasting federal policy intervention” to keep them operating. The Trump Administration has been working to develop policies to support nuclear and coal plants, going so far as to propose unprecedented market intrusions. For coal plants, however, many in the power industry think there is little that can be done to stop the fuel’s downward trend in the U.S. The struggle of emissions-free nuclear plants has created a dilemma for U.S. policy makers who want to keep the plants online but are seeing them struggle economically and retire. Many in the nuclear industry are looking to smaller, modular reactors as a way to revive the struggling technology. The smaller nuclear plants could start at prices as low as $1 billion to $1.5 billion to construct, according to some experts. While many believe SMRs could propel new growth in the nuclear industry, there may be less hope for fossil fuels according to Bloomberg. “The economic case for building new coal and gas capacity is crumbling, as batteries start to encroach on the flexibility and peaking revenues enjoyed by fossil fuel plants,” the report finds.